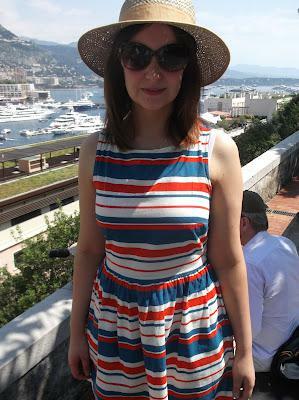 I knew that no matter what I wore while I was in Monaco I would feel like a little scrubber compared to to local glamazons but I did my best regardless and wore a series of high street summer dresses. We were only away for four days and had a very small luggage allowance so I had to pick outfits which could easily take me from day to night. Generally I wore a dress during the day with flat sandals and subtle jewelry and glammed myself up a bit for night time by changing into some gorge KG platform sandals, glamming up my make-up and adding more dramatic jewelry. can you believe I only took two pairs of shoes with me?? I am so proud of myself! I wore the outfit below on day one. Most of that day was spent traveling from Glasgow to Nice so I just wanted something comfy that I could fling on. I bought the dress from a second hand shop in Berlin last year and the necklace is from H&M. I love turquoise jewelry for the summer. My hair is a bit of a hot mess here! I had been experimenting with Toni & Guys Sea Salt Texturising Spray which is supposed to give you beachy waves but the jury is out on that one for me.I wore the little dress below on the second day of our holiday. We traveled into Monaco and walked the F1 track and had a look at the paddocks. This was a dream come true for me and Mr Juicy and was very surreal! The dress was from Warehouse and the little black belt came with it. The sandals are Birkenstocks which I bought from Sarenza. Ok, I know they are not the sexiest of summer sandals but they are seriously comfy as they mold themselves around the bottom of your foot. We did a lot of walking on this holiday and I was so thankful of that when I felt great but my traveling companions were complaining of painful blisters! Mr Juicy does call these my Dork-enstocks though :-s The anklet is from Accessorise. On Day 3 we went to watch qualifying which was our first look at the F1 cars in action. AMAZING! The noise is unreal! 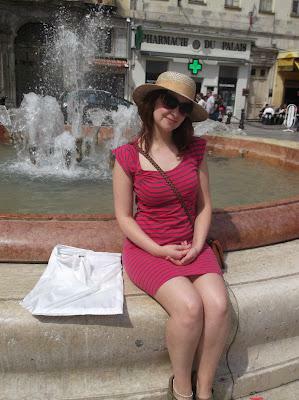 I wore this striped cotton dress from People Tree and my new straw hat which I'd bought in Monaco that day. A hat is a must if you're standing out in the sun for any length of time. Day 4 was race day so I wore my favorite dress out of the ones which I'd brought with me. It;s from Topshop and the shape is the most flattering for a pear shaped figure like mine. The second photo is an example of how I took my outfits from day to night.